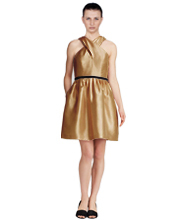 Wear the chic glam look with this beautiful metallic lambskin dress that flaunts the latest trends at its best. Crossed front and back neck pattern along with the elastic waistband giving the dress a pleated look, makes this pretty little leatherwear ideal for your party nights. Handfinished to perfection, it offers you a soft and comfortable feel.